What if we filled liters of light? 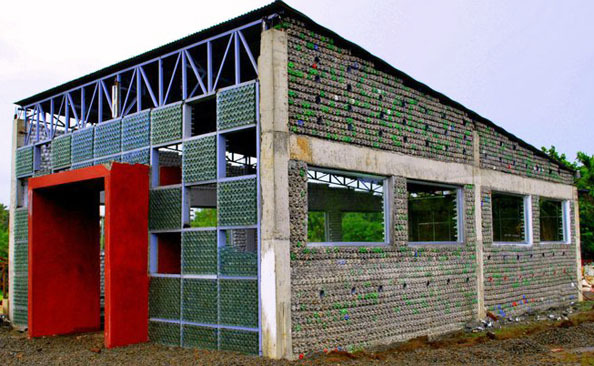 Seen on the Curiosity Counts blog was this extraordinary initiative from the MyShelter Foundation in the Philippines, created by the social entrepreneur Illac Diaz, who has already been made well-known by his Bottle School project (see the photo below of a school constructed out of recycled plastic and glass bottles). The project “Isang Litrong Liwanag” (literally, “A liter of light”) aims to give light to 1 million homes (out of 3 million that don’t have any). Conceived by students at MIT, the bottle light contains a mix of clean water and some bleach and when placed in the roof, refracts sunshine into the home, equivalent to a 55W bulb. To know more and to support the project, see their site, A Liter of Light.